All department and user administration is performed using the Out’n About! for Outlook client interface. In order to perform these functions, the logged in user must have Out’n About! administrator rights. When initially adding departments and users to the Out’n About! for Outlook system, login as the user configured during the server installation process. The system administration menu is used to add departments and users to the system. This menu is available from the main Outlook ribbon. 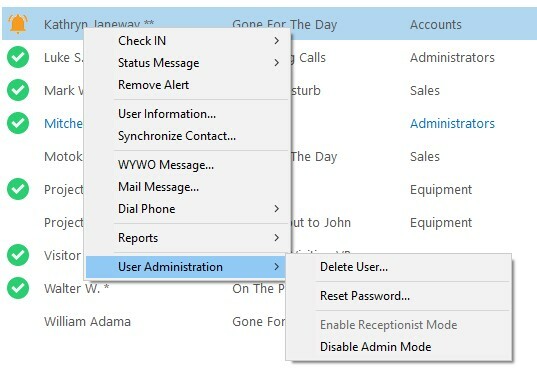 The user administration menu is used to perform administrative operations on existing users in the system. This menu is available by double clicking or right clicking on an existing user in the In/Out Status Board. The first step in configuring the Out’n About! In/Out Status Board is to add the department names in your organization. Departments are used by Out’n About! users to quickly view only the employees who belong to a department on their In/Out Status Board. 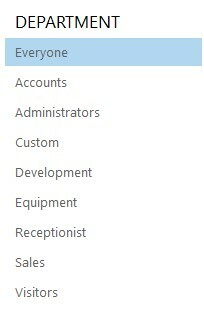 Using the main administrator menu, select the “Departments…” menu item. 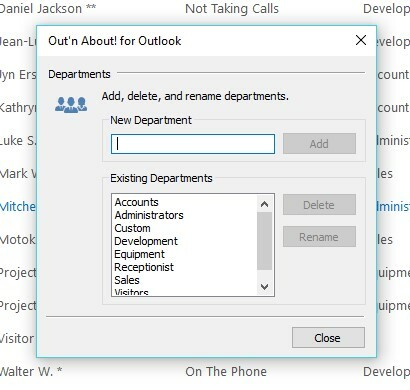 You can also quickly display the Departments dialog by right clicking on a department or the department group title on the Out’n About! Departments Panel. You can Add, delete, and rename departments using this dialog.